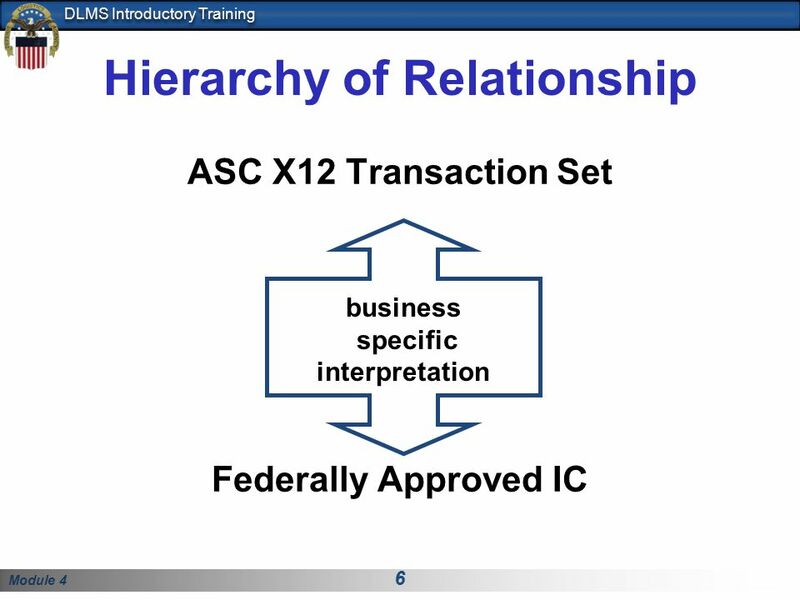 ASC X12 Transaction Set Federally Approved IC business specific interpretation An Implementation Convention is a document which serves as a guide for using an ASC X12 transaction within a given business application. ICs define the structure and content of a transaction and map application data requirements into a specific location in the transaction set. 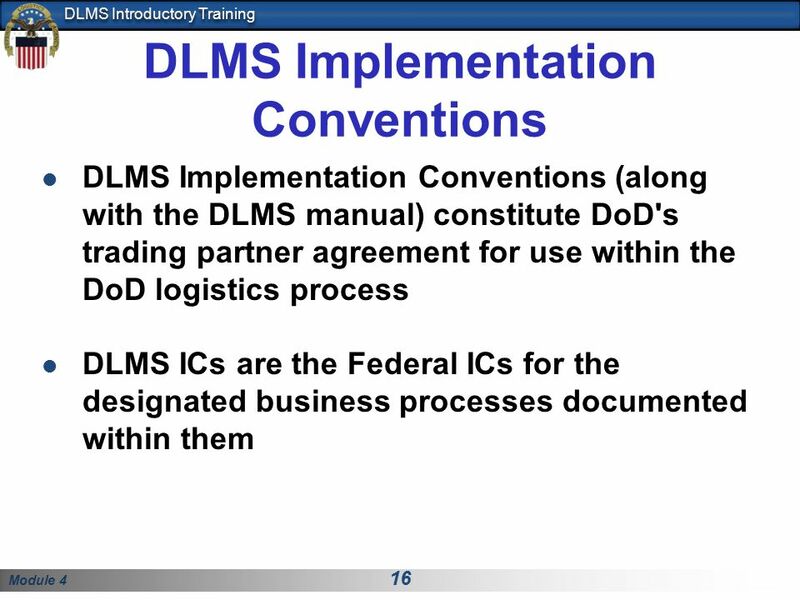 All IC supporting the DLMS implementation have been Federally Approved. 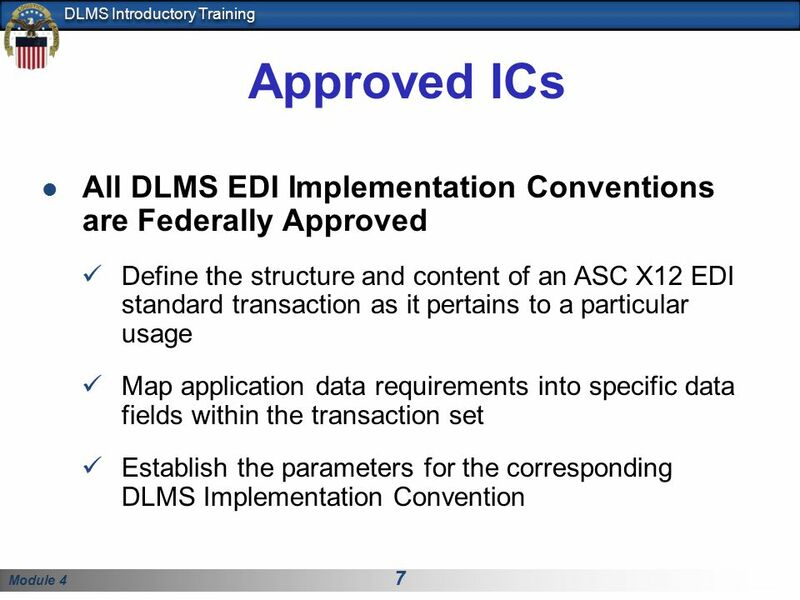 7 Approved ICs All DLMS EDI Implementation Conventions are Federally Approved Define the structure and content of an ASC X12 EDI standard transaction as it pertains to a particular usage Map application data requirements into specific data fields within the transaction set Establish the parameters for the corresponding DLMS Implementation Convention Federally Approved: Coordination administered by the Electronic Data Interchange Standards Management Committee (EDISMC) and the Federal EDI Standards Management Coordinating Committee (FESMCC). 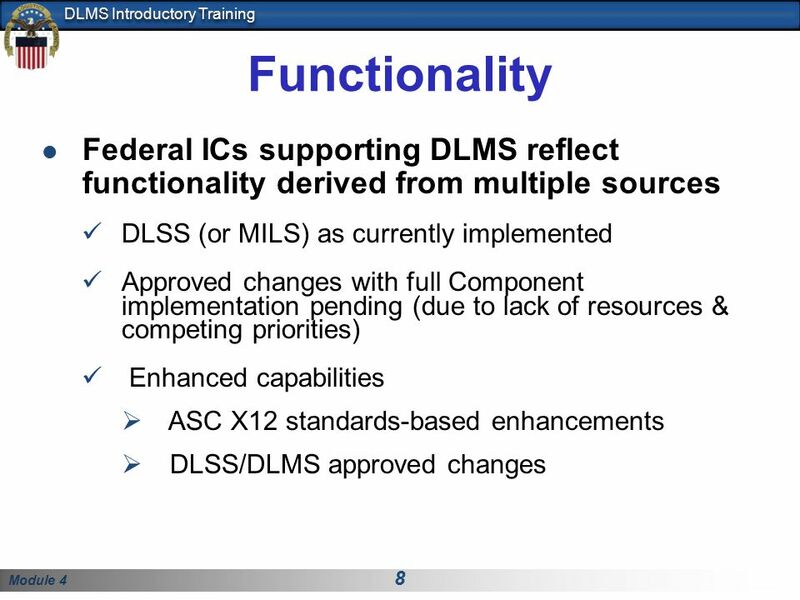 8 Functionality Federal ICs supporting DLMS reflect functionality derived from multiple sources DLSS (or MILS) as currently implemented Approved changes with full Component implementation pending (due to lack of resources & competing priorities) Enhanced capabilities ASC X12 standards-based enhancements DLSS/DLMS approved changes The Federal ICs supporting DLMS implementation have functionality derived from several sources. 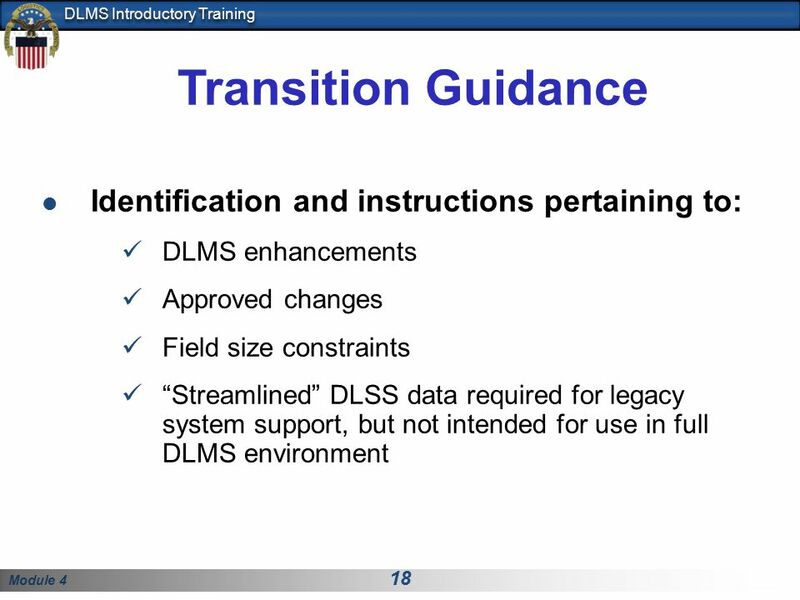 DLSS (or MILS) as currently implemented: Supply Finance (interfund billing) Transportation Contract Administration Backlog of approved changes with full Component implementation pending (due to lack of resources & competing priorities). Some of these in the supply area are as much as 10 years old and their validity in today's environment is being re-evaluated by the Supply PRC. Enhanced capabilities beyond the scope of the DLSS were derived from two sources: Some resulted from a data call for suggested improvement to the logistics process. Thee were more than 300 S/A submitted enhancements – prepared without regard to logistics systems limitations at the time. More than 100 were incorporated as “placeholders”, most without supporting procedures. 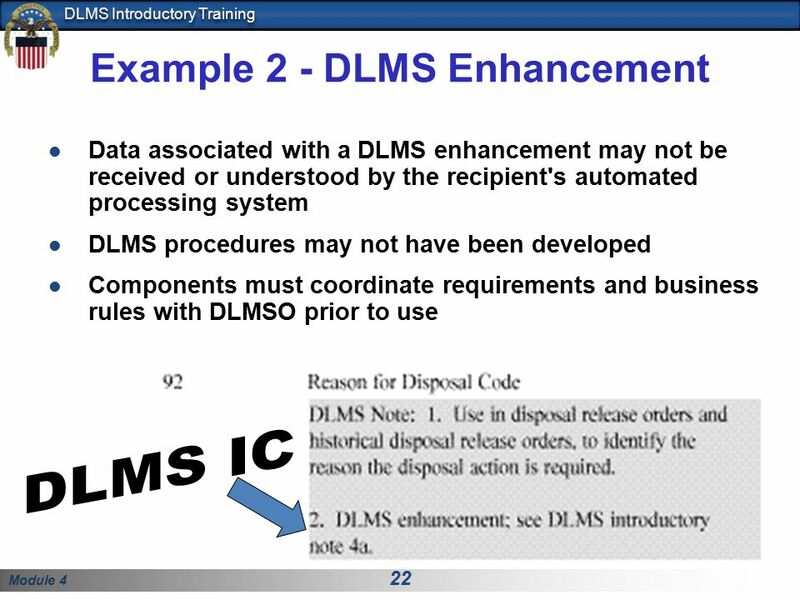 The DLMS PRCs are revalidating these enhancements and will staff change proposals as necessary to develop coordinated procedures for implementation under the DLMS. Others came purely with the transition to ASC X12 – they reflect the flexible, robust nature of ASC X12 EDI. We’ll look at some of these in closer detail. 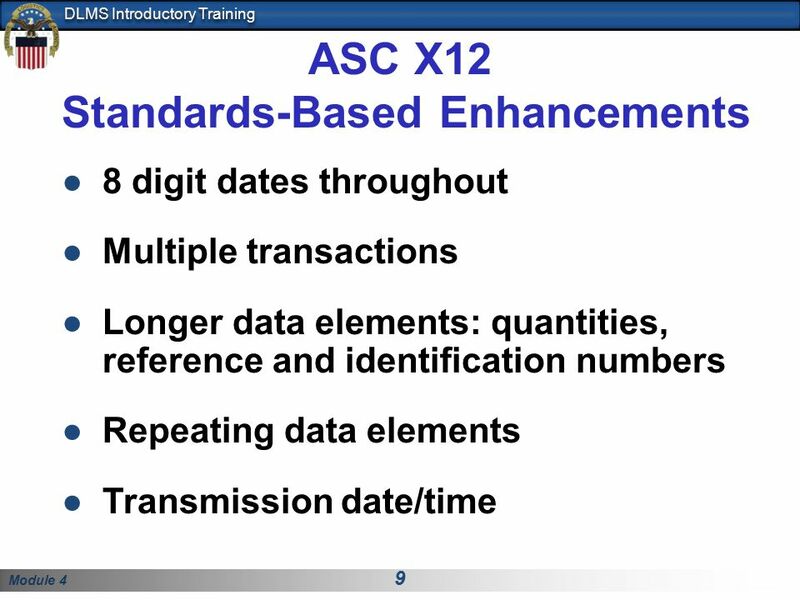 ASC X12 Standards-Based Enhancements 8 digit dates throughout Multiple transactions Longer data elements: quantities, reference and identification numbers Repeating data elements Transmission date/time Dates: No Y2k-like problems associated with the DLMS Multiple transactions: Using the looping structure we learned about in Module 2, it is possible to transmit multiple transactions within a single transaction set. 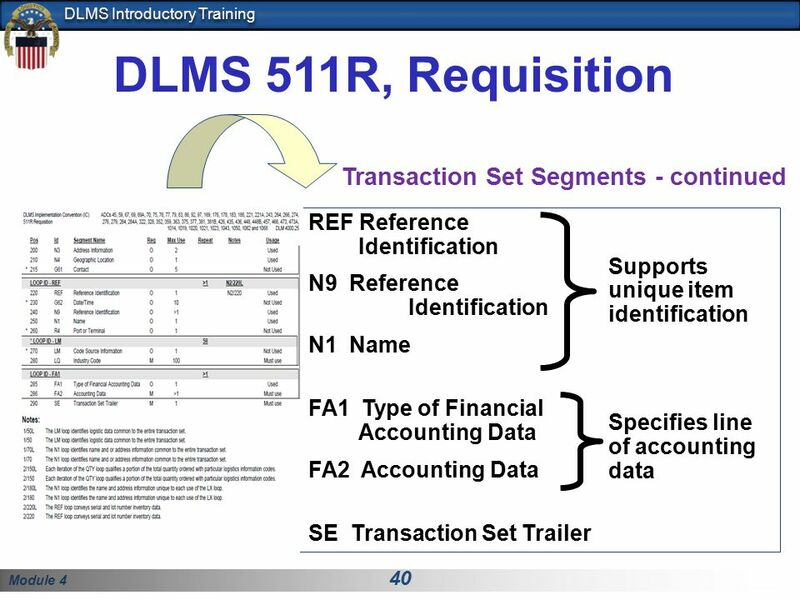 That is to say, many requisitions can be carried in a single 511R transaction set. This efficiency of design permits us to economize on transmission size and therefore cost. Spell out further if audience not clear how this works. 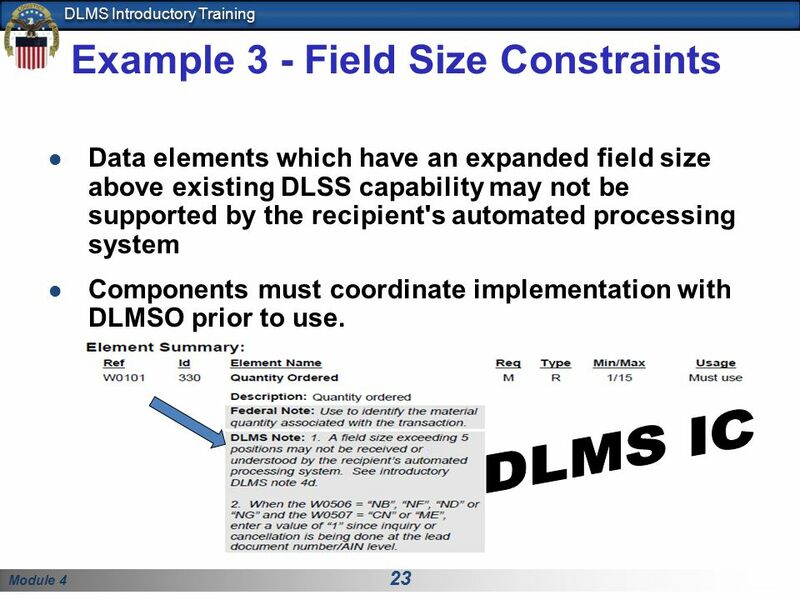 Longer data elements: for example the DLSS only allows for a field size of 5 positions for the quantity requisitioned. While this is adequate for most material, it doesn’t work well for some, forcing work around solutions such as the multiplier code which must be used for ammunition requisitions to express in thousands any quantity larger than 99, 999. Repeating data elements: the ASC X12-derived ability to carry multiple iterations at the segment level allow flexibility to repeat multiple instances of particular types of information. 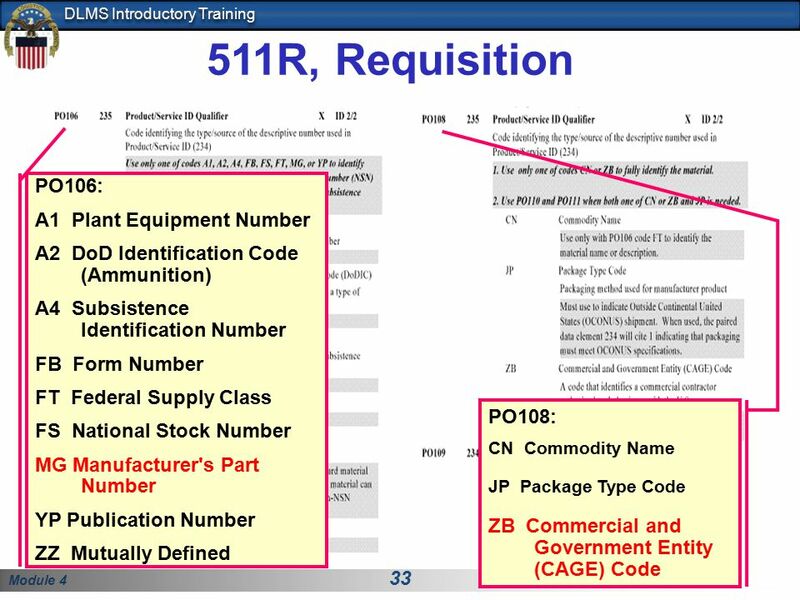 For example in today’s environment it is possible to include only a single advise code on a requisition requesting specific action from the ICP. Where it would have been beneficial to request multiple actions the customer is forced to chose only one code. 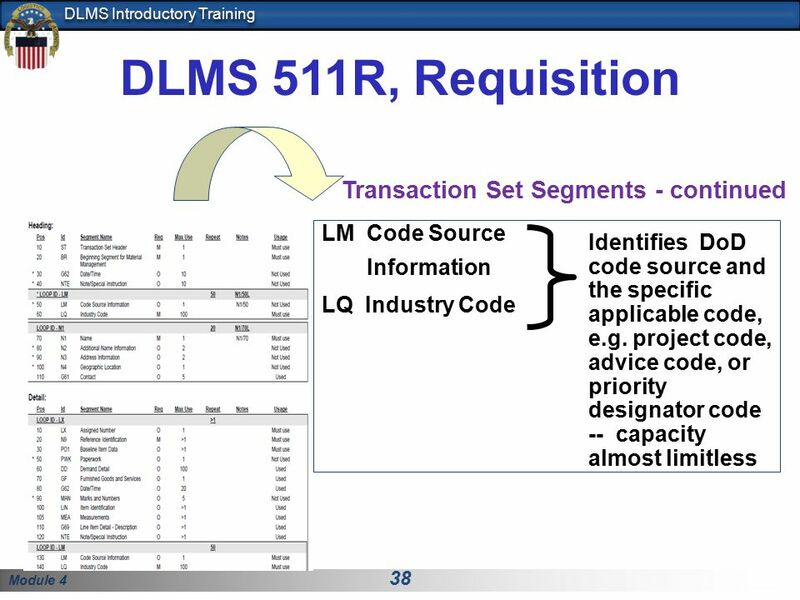 Under the DLMS, it will be possible to transmit as many advice codes as necessary to fully support an individual requirement. Transmission date/time: Each beginning segment provides a date-time stamp capturing the actual date/time the transaction is created. 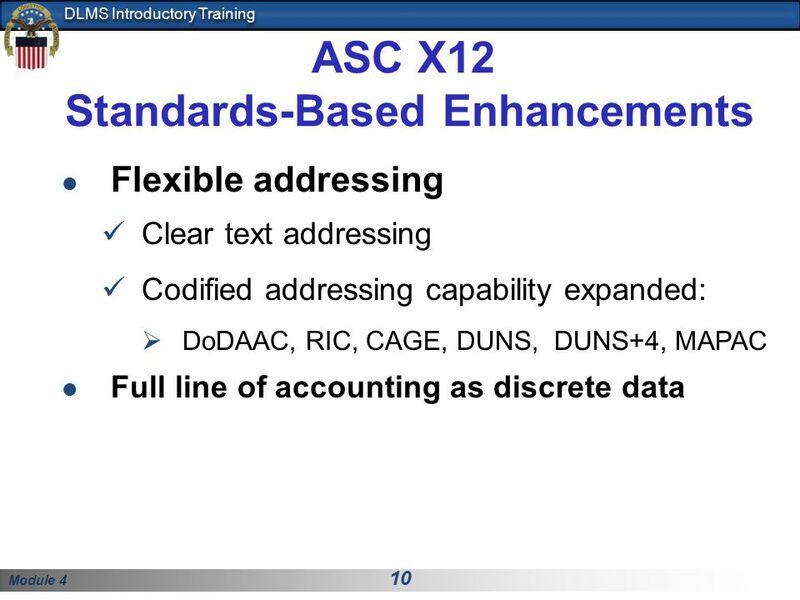 ASC X12 Standards-Based Enhancements Flexible addressing Clear text addressing Codified addressing capability expanded: DoDAAC, RIC, CAGE, DUNS, DUNS+4, MAPAC Full line of accounting as discrete data Flexible addressing: Allows us to carry a clear text address – without using a trailer card – when authorized under the governing procedures DoDAAC=Department of Defense Activity Address Code (Services also refer to by other names) RIC=Routing Identifier Code (three position code) CAGE=Commercial and Government Entity Code (used to identify contractors if no DoDAAC assigned) DUNS=Dun and Bradstreet assigned code identifies Government and commercial locations DUNS+4=added suffix MAPAC=Military Assistance Program Activity Address Code=compiled code used for Security Assistance customers Full line of accounting as discrete data: Fund Code (current capability) Two-position code used to identify the accounts to be debited or credited for material or services Under DLMS: Full accounting data conveyed through various elements in the Type of Financial Accounting Data (FA1) and Accounting Data (FA2) segments Accounting segments greatly expand potential information: Identification of service or charge, basic appropriation number, supplemental accounting classification data, authorization accounting authority, fiscal station number, etc. 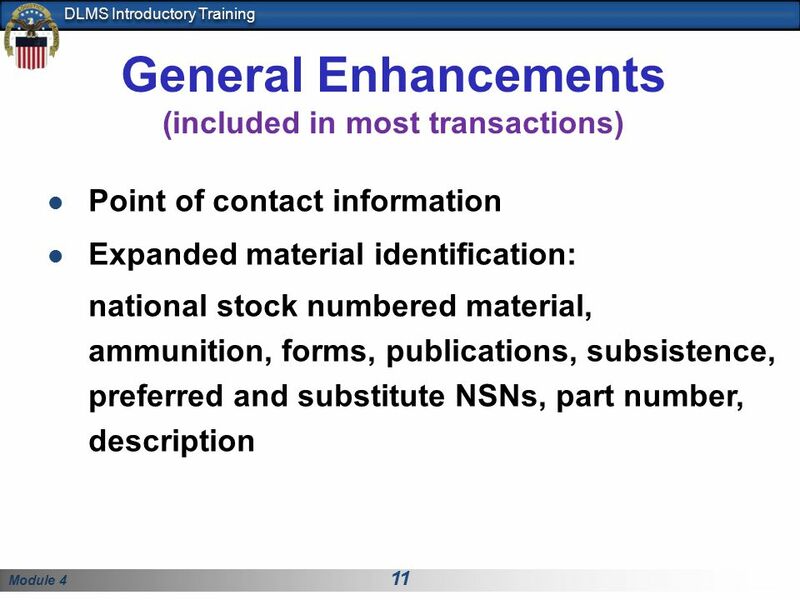 General Enhancements (included in most transactions) Point of contact information Expanded material identification: national stock numbered material, ammunition, forms, publications, subsistence, preferred and substitute NSNs, part number, description Some enhancements are common to most of the DLMS transactions, so we’ll review these now. 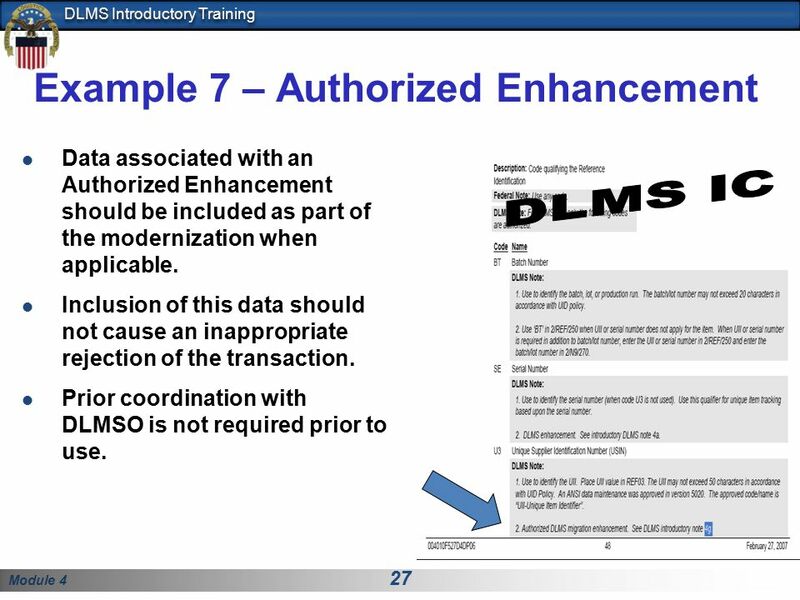 Later, when we discuss individual transactions used to support specific business functions, we’ll identify some process specific enhancements offered under DLMS. Point of contact information: Under exception circumstances, POC information (such as name, phone, address) will make it possible to get to the source or a knowledgeable individual to quickly resolve a problem situation. Expanded material identification: The DLMS makes it possible to discretely identify the required material using various codes or descriptive features for non-standard material. 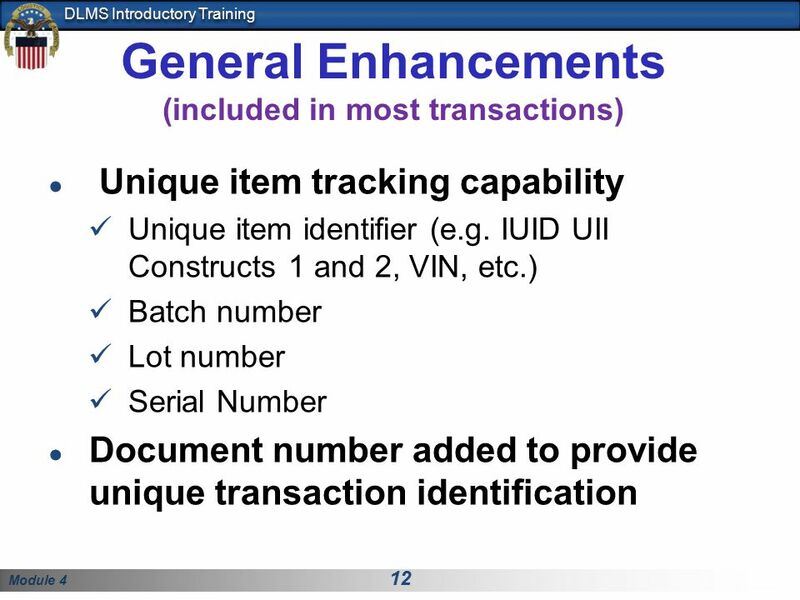 General Enhancements (included in most transactions) Unique item tracking capability Unique item identifier (e.g. IUID UII Constructs 1 and 2, VIN, etc.) Batch number Lot number Serial Number Document number added to provide unique transaction identification Unique item tracking capability: Today under the DLSS and DLMS, there are specific procedures for tracking movement of selected items, such as small arms, using the item’s serial number. 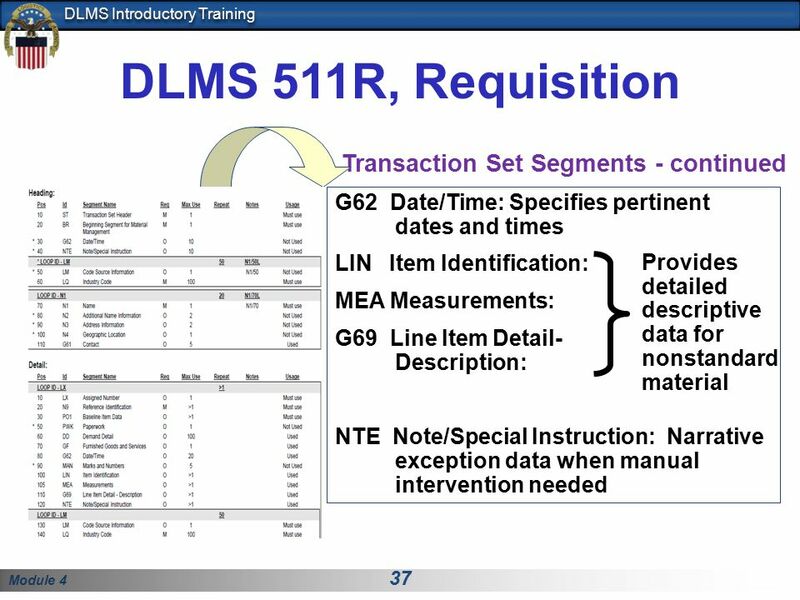 There is an ongoing initiative within the DoD to improve and expand tracking capability for additional items (perhaps an engine assembly or controlled cryptographic material). 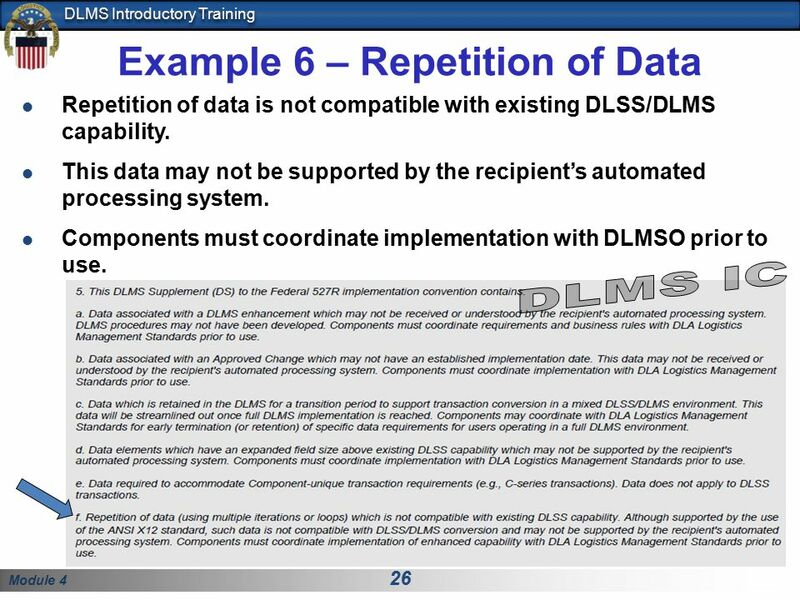 This is impossible to do within the constraints of the existing DLSS 80 position transactions. However, the DLMS will permit flexible and detailed identification for tracking purposes within standard logistics transactions. The elements listed are examples of the types of data which would facilitate tracking. The Unique Item Tracking Committee and the Joint Small Arms Coordinating Group (UITC/JSACG) are working together to develop the necessary procedures to implement this process. Unique transactions identification: Under the DLSS there were a few transactions in the MILSTRAP functional area that did not include a document number. 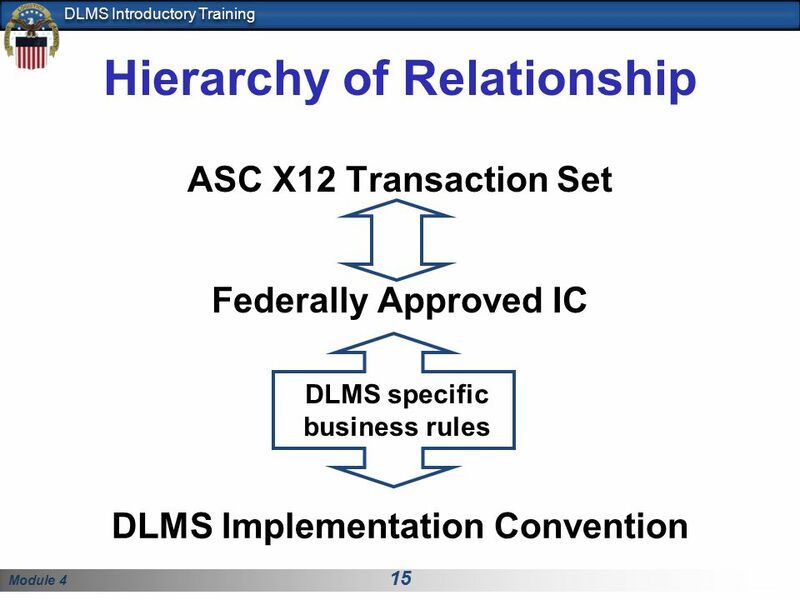 ASC X12 Transaction Set Federally Approved IC DLMS specific business rules DLMS Implementation Convention In this depiction of the hierarchy of relationship we see that a new level is introduced below the Federally Approved ICs. 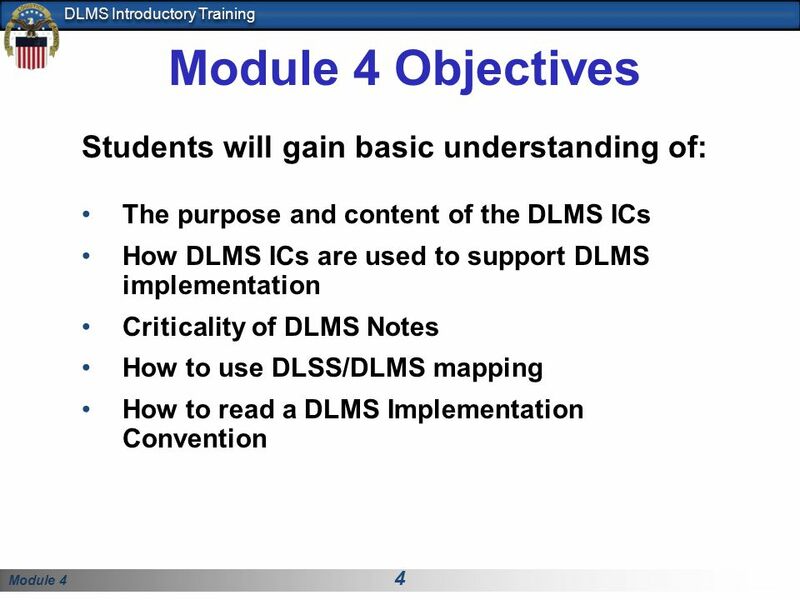 It is the DLMS Implementation Convention which provides all the detailed rules and information which will enable a successful implementation. 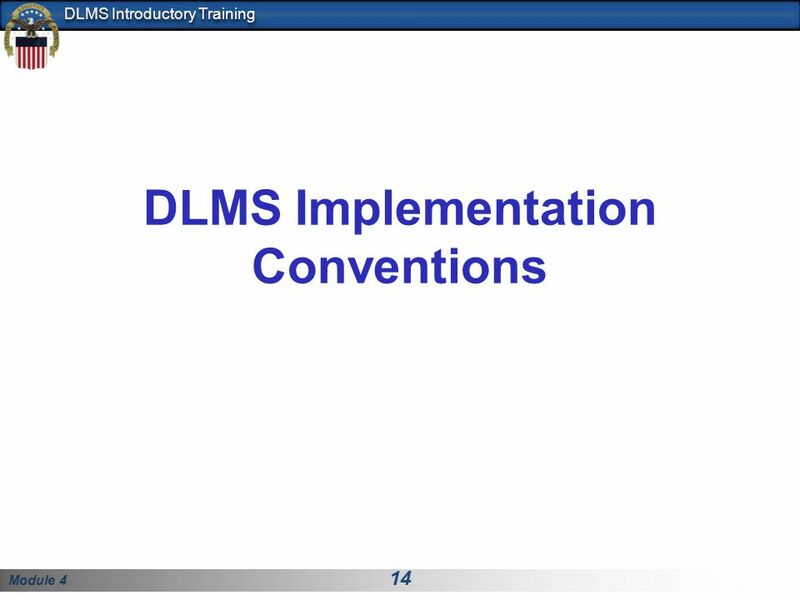 What are the DLMS Implementation Conventions? – next slide. 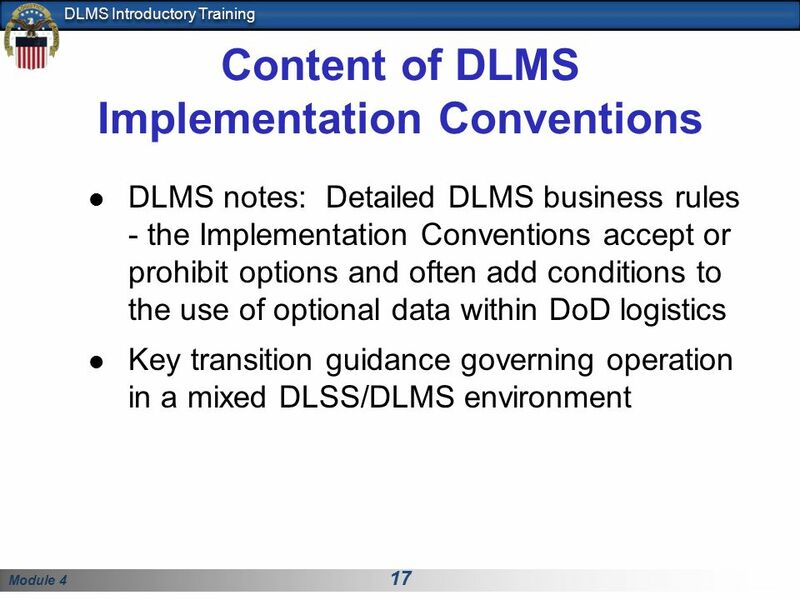 DLMS notes: Detailed DLMS business rules - the Implementation Conventions accept or prohibit options and often add conditions to the use of optional data within DoD logistics Key transition guidance governing operation in a mixed DLSS/DLMS environment Transition to next slide: What constitutes transition guidance? 19 Streamlining Goals Reduce retransmission of data perpetuated from previously submitted transactions Already resident in sender’s and receiver’s system Example: Original (non-mandatory) requisition data may be streamlined out of follow-up transactions Reduce encoded data content where transaction size constraint was the sole reason for encoding DLMS offers capability to communicate more fully or more precisely Transitioning is long term goal There are two types of data which are being targeted for “streamlining”. 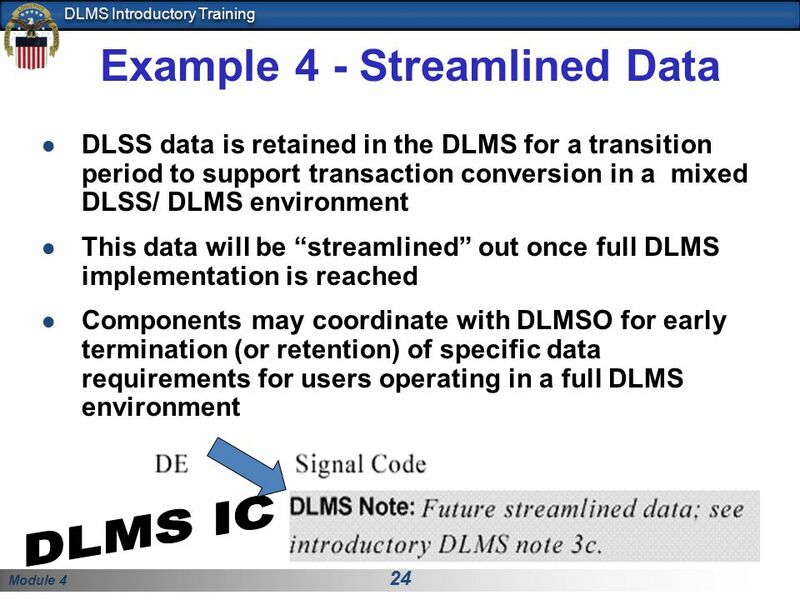 Transition: Next slides will show three examples of DLMS streamlining target codes to give you a better ideal of which codes we hope to eliminate some day. 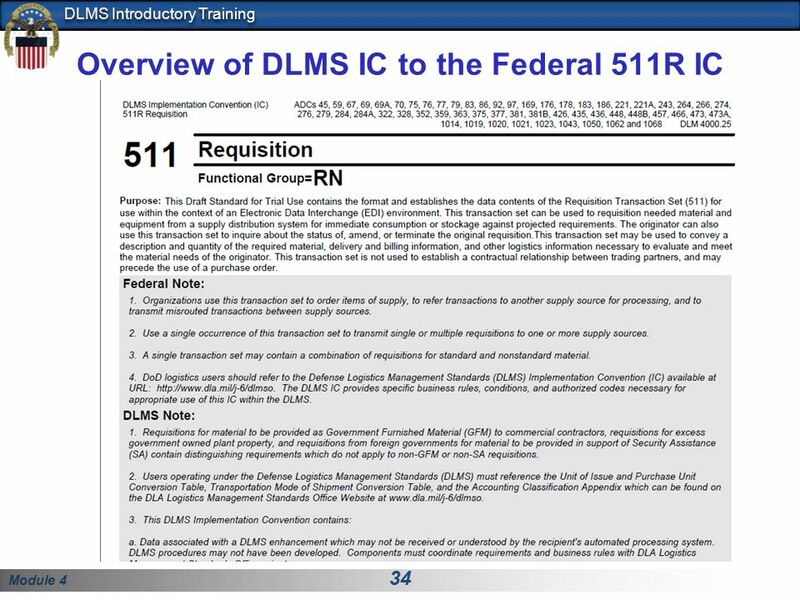 DLMS Business Rules DLMS Enhancements Field Size Constraints Streamlined Data Approved DLMS Changes Review: The Implementation Convention mirrors the Federal IC. Therefore, it contains information derived from the ASC X12 standard e.g. 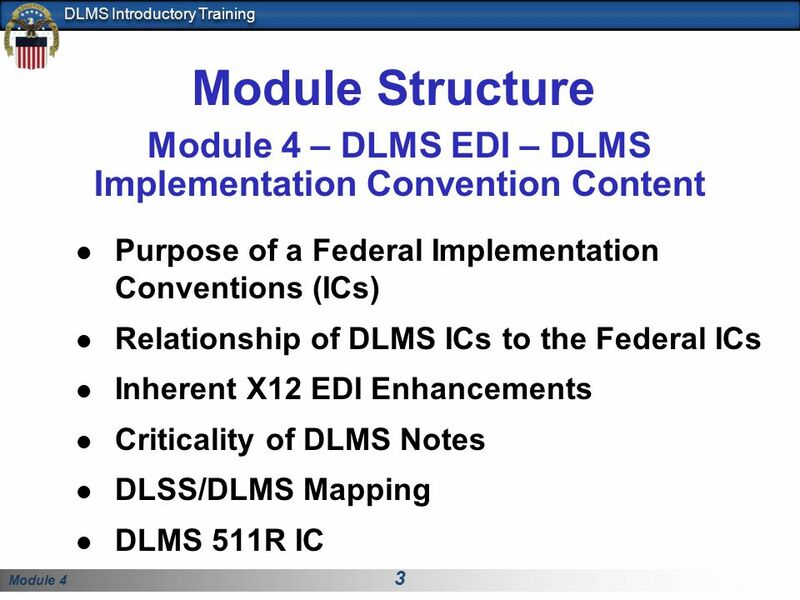 syntax notes /definitions/etc -- things we learned about in module 4 and it shows notes derived from the Federal IC. 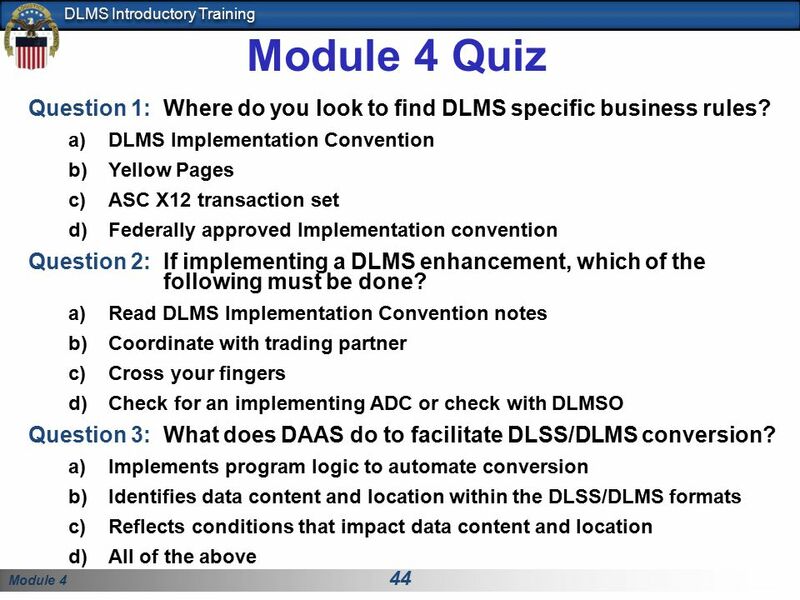 The DLMS Implementation Convention Notes fall into 5 categories. 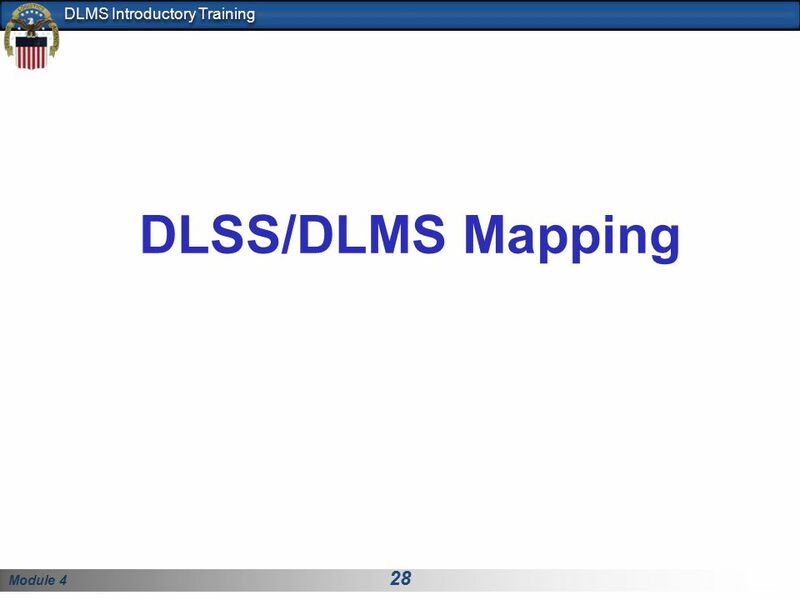 They are: DLMS business rules DLMS enhancements Field size constraints Streamlined data Approved DLMS changes Lets take a look at each. 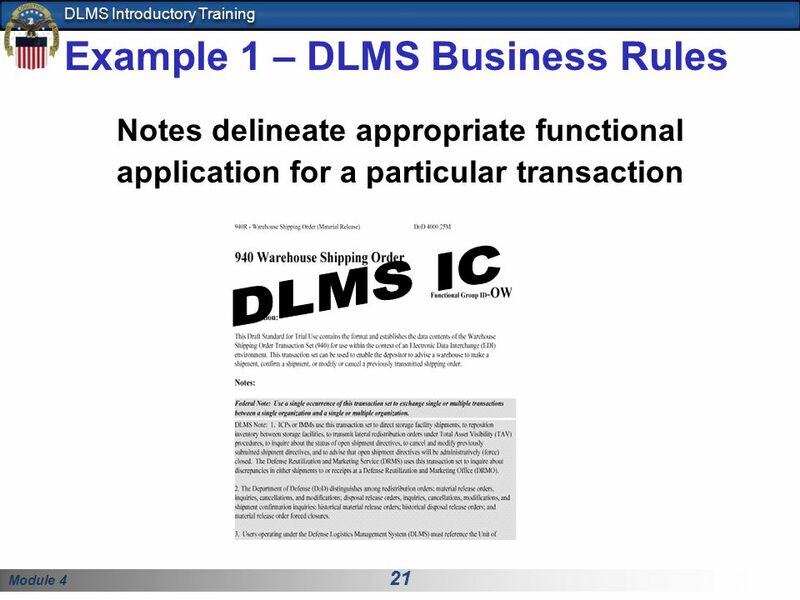 Notes delineate appropriate functional application for a particular transaction DLMS IC As stated previously: Detailed DLMS business rules – the Implementation Conventions accept or prohibit options and often add conditions to the use of optional data within DoD logistics At the transaction set level, as shown in this slide, these notes provide detailed information about when and why this particular transaction is used. 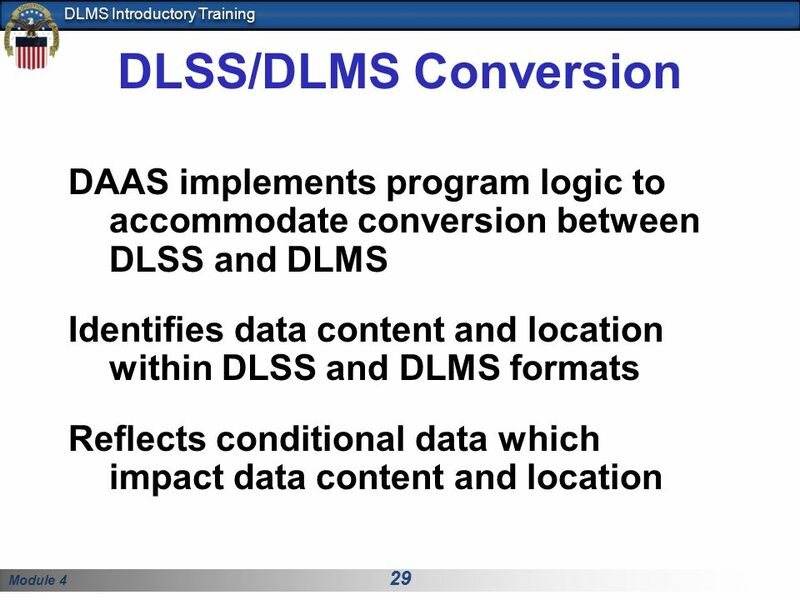 28 DLSS/DLMS Mapping As we discussed in Module 4, the technique for relating the data fields between different formats is referred to as mapping. 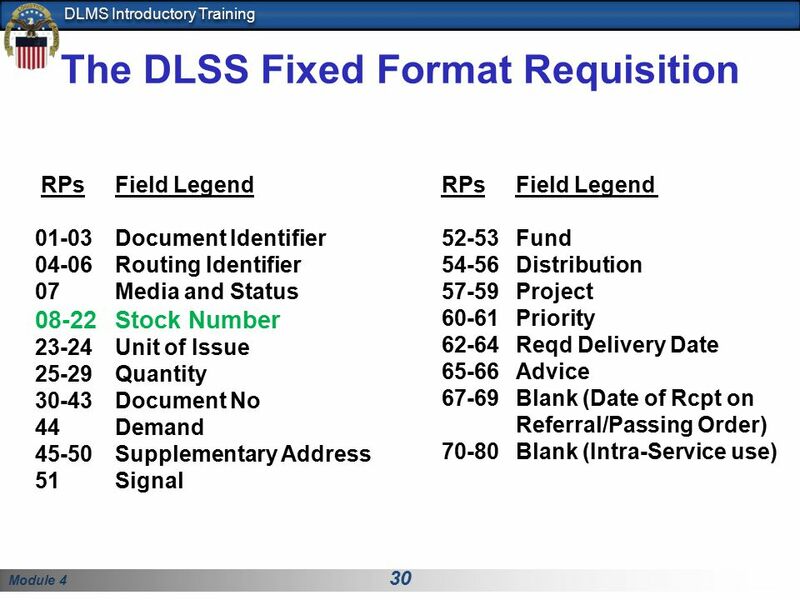 RPs Field Legend Document Identifier Routing Identifier Media and Status Stock Number Unit of Issue Quantity Document No Demand Supplementary Address Signal Fund Distribution Project Priority Reqd Delivery Date Advice Blank (Date of Rcpt on Referral/Passing Order) Blank (Intra-Service use) We’ll use the requisition for a mapping demonstration and explore conversion from the 80 record position Document Identifier A0 series requisition and the 511R requisition under the DLMS We’ll take a closer look at how each captures material identification data. Using the material identification information, I’ll show how the DAASC mapping converts from the DLSS to the DLMS. 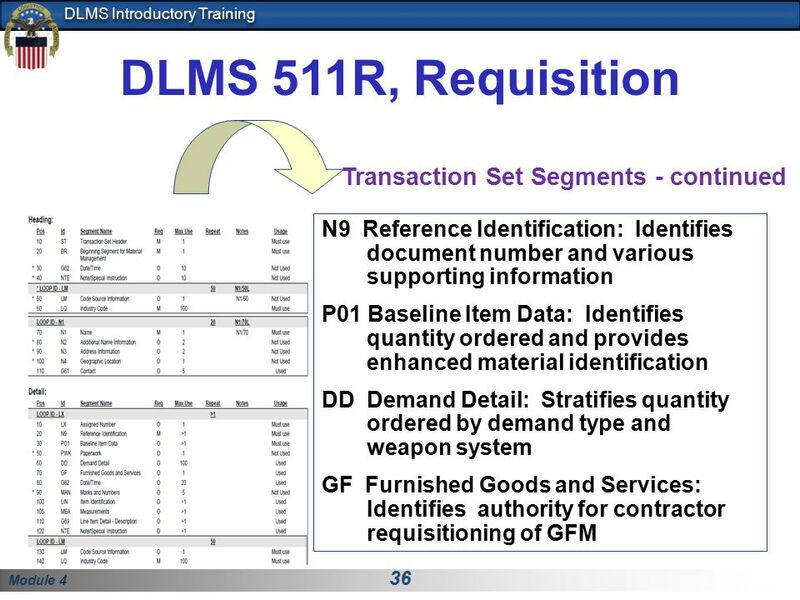 Many of you are familiar with the requisition format shown here. 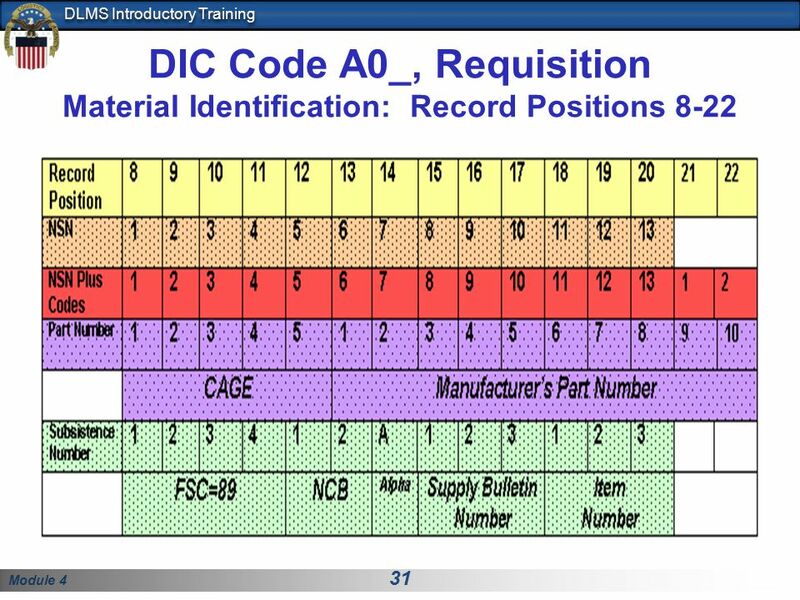 Record position 8-22 (highlighted) supports use of multiple codes for identification of material. Transition: Next slide we’ll take a closer look at the various types of material identification which are authorized under MILSTRIP. 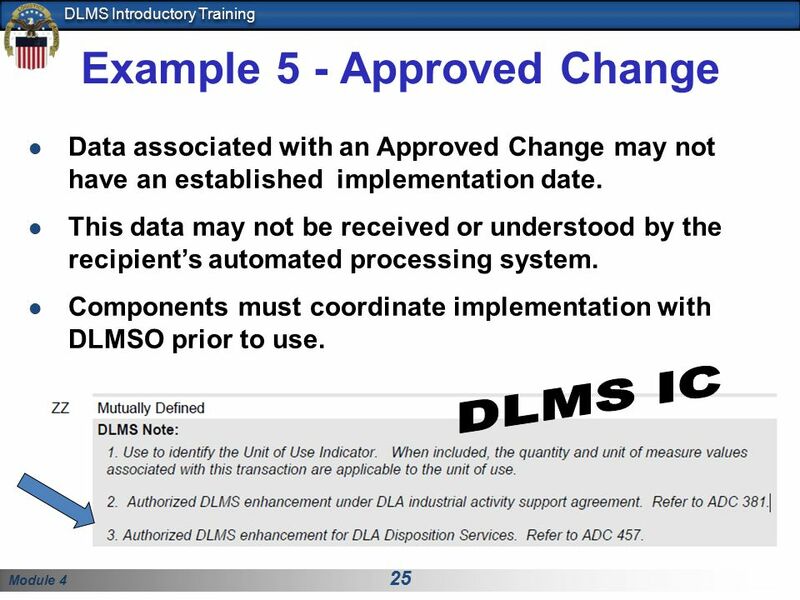 To understand the transition of data between MILS and DLMS, we use a mapping document such as depicted here. 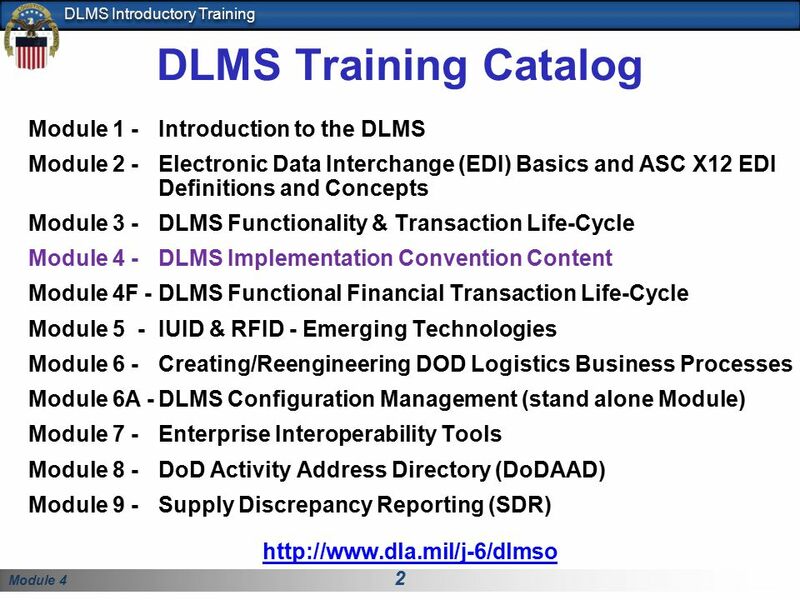 The mapping document shows the logic used by the DAAS conversion software to ensure we have interoperability -- the customer may requisition in MILS while the source of supply is operating in a DLMS environment. It is also the best tool for understanding the appropriate placement of MILS data content within the DLMS format, and must be used during migration design work. The mapping documents are provided by DAASC upon request by the Government lead. 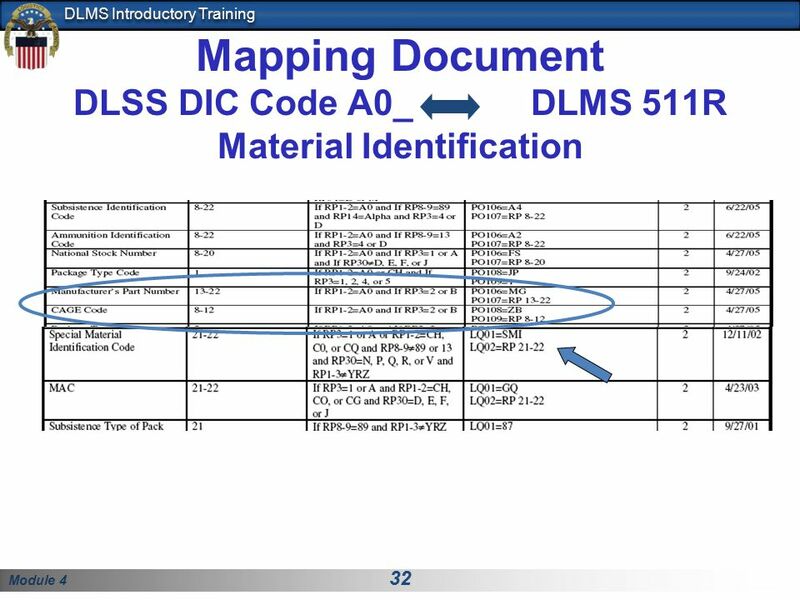 In our previous slide we saw the part number and CAGE identified in the P0106 and P The mapping document describes the logic to move these data elements and others providing material identification between the MILS and DLMS formats. For example, if the Document Identifier in record positions 1-2 is A0 we know we are seeing a requisition. If record position 3 is a B, it is a requisition for a part numbered item. The map would then move the values from record positions into the P0107 with qualifier MG (part number) in P The map would also move the values from record positions 8-12 into the P0109 with qualifier ZB (CAGE) in P0108. 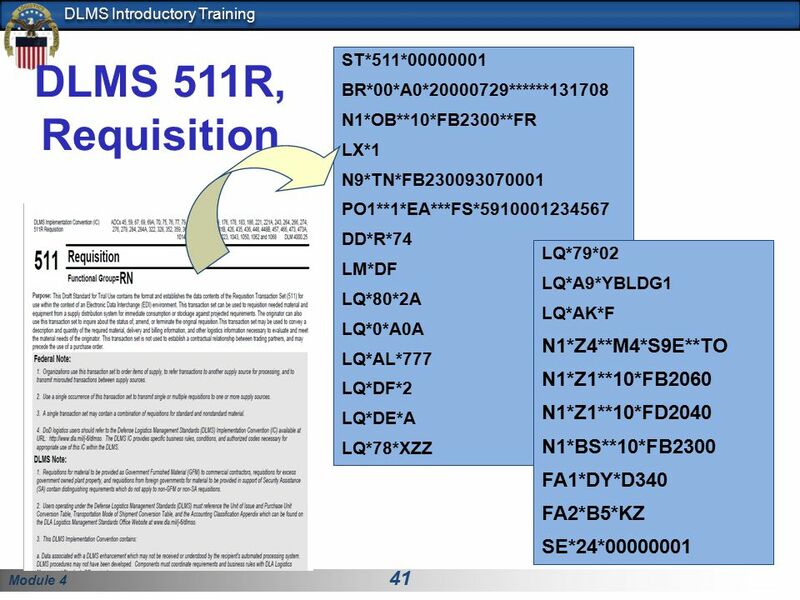 Notice also how the map provides for conversion of Service unique data such as the Navy SMIC (green arrow) or the AF unique MMAC normally carried in the MILS stock number field. Under the DLMS, these are discretely identified data elements. Since the SMIC and the MMAC values are maintained as a code list, these data elements are mapped to the LQ using the appropriate qualifier. 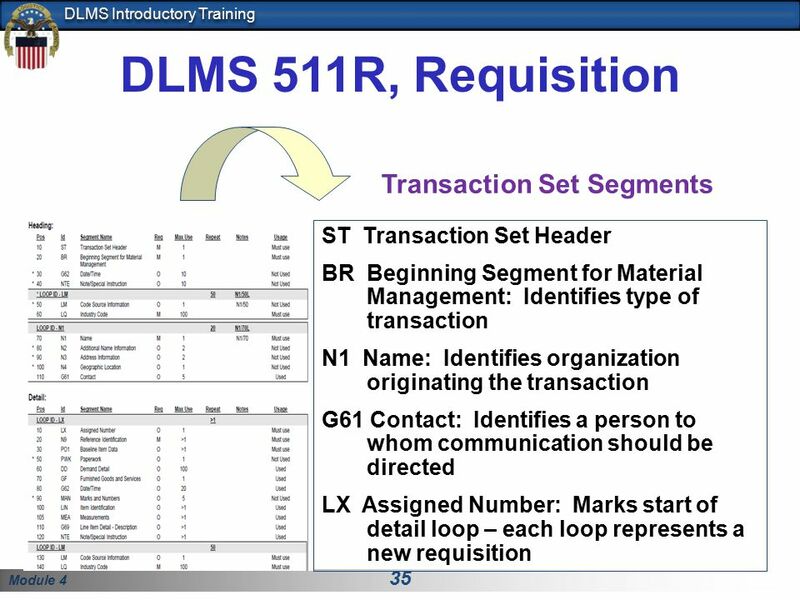 ST Transaction Set Header BR Beginning Segment for Material Management: Identifies type of transaction N1 Name: Identifies organization originating the transaction G61 Contact: Identifies a person to whom communication should be directed LX Assigned Number: Marks start of detail loop – each loop represents a new requisition First we’ll take a quick look at what segments are selected for use in the Implementation Convention. Then we’ll move on to the actual document. N2 Additional Name Information N3 Address Information N4 Geographic Location Identifies specific parties by type of organization, e.g. ship-to, bill-to, status recipients. Allows various identifying codes or clear text address. 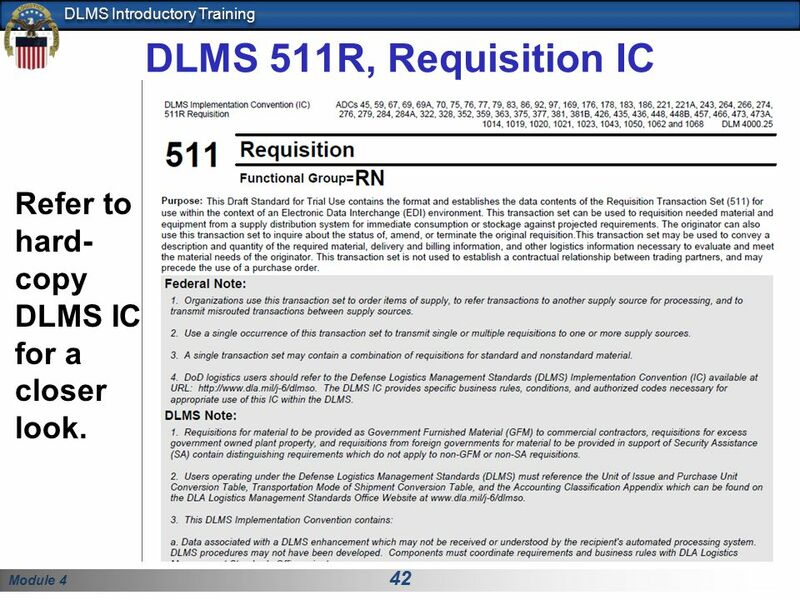 42 DLMS 511R, Requisition IC Refer to hard-copy DLMS IC for a closer look. 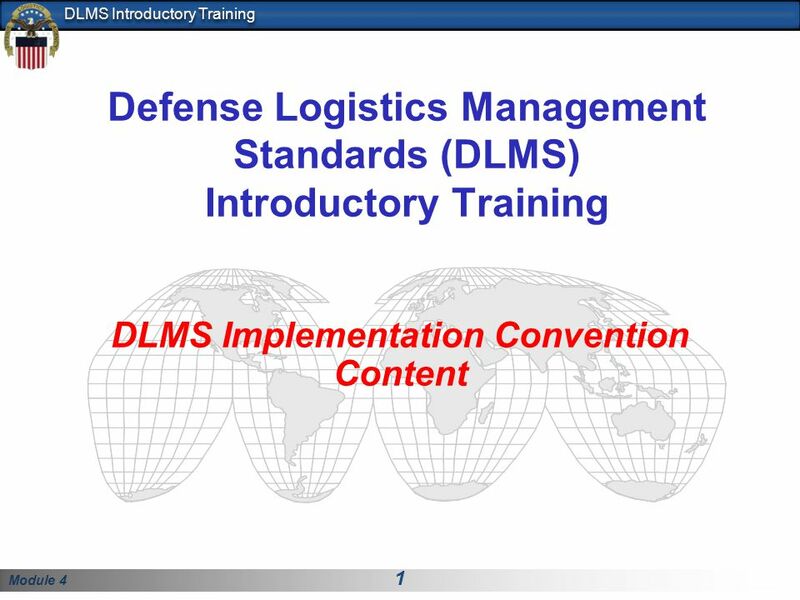 Download ppt "Defense Logistics Management Standards (DLMS) Introductory Training"
1 PDC Under Development PDC 331 PDC 331, Procedures for Prepositioned Materiel Receipt (PMR) and Shipment Status for Retrograde and Directed Discrepant/Deficient. One NAVSUP… One Enterprise Presented to: DoDAAD Process Review Committee NAVSUP Weapons Systems Support By Lucy Giboyeaux NAVY RIC Monitor 23 August 2011. 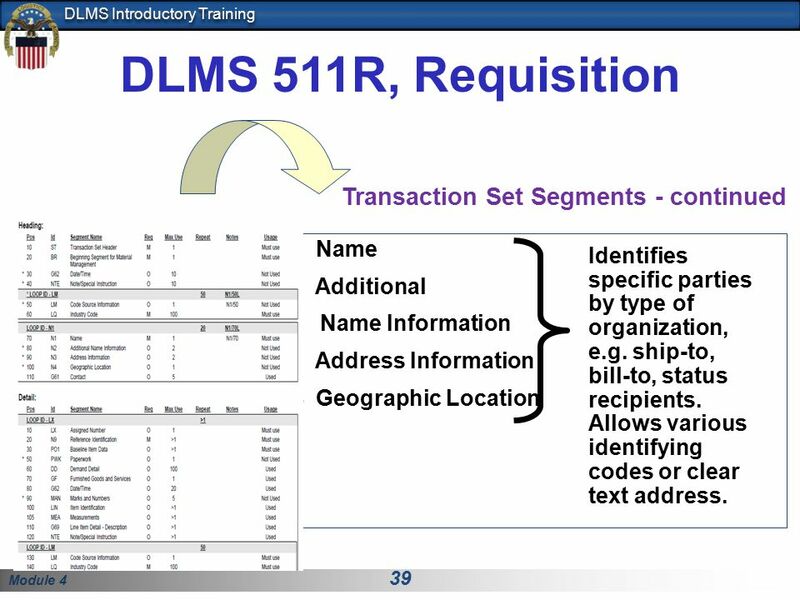 Next Generation Logistics Transactions – Extensible Markup Language (XML) Kick-Off Meeting DLSS/DLMS X12 & XML – Our Approach Dale Yeakel & Nat Obey Defense. 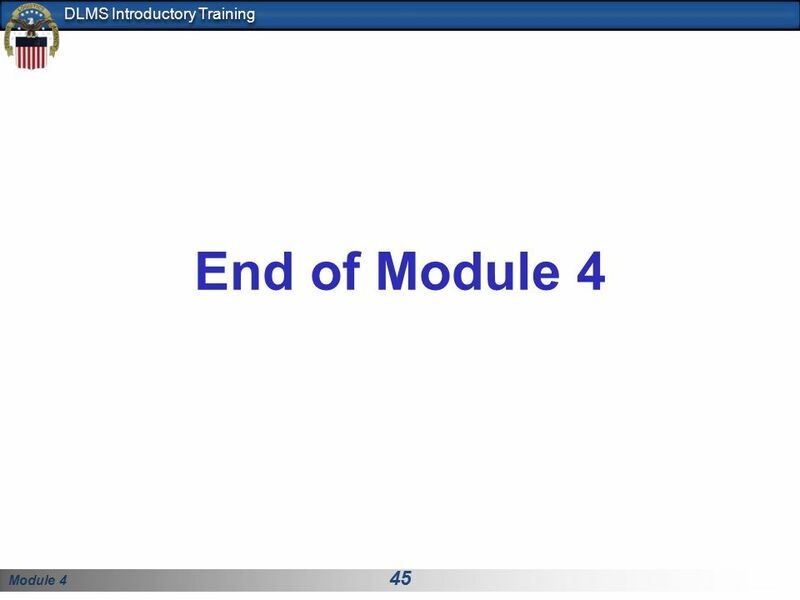 02/03/2006EBT and EDI Overview1 Electronic Business Electronic Data Interchange (EDI) & Electronic Business Transactions (EBT) Standards. 1 WARFIGHTER SUPPORT STEWARDSHIP EXCELLENCE WORKFORCE DEVELOPMENT WARFIGHTER-FOCUSED, GLOBALLY RESPONSIVE, FISCALLY RESPONSIBLE SUPPLY CHAIN LEADERSHIP. PantherSoft Financials Smart Internal Billing. Agenda  Benefits  Security and User Roles  Definitions  Workflow  Defining/Modifying Items  Creating. Presented by: Gail G. Goodwin, CPIM Principal Solution Consultant. DEFENSE LOGISTICS AGENCY AMERICA’S COMBAT LOGISTICS SUPPORT AGENCY DEFENSE LOGISTICS AGENCY AMERICA’S COMBAT LOGISTICS SUPPORT AGENCY WARFIGHTER SUPPORT. EsMD Harmonization UC2 Data Element Prioritization 8/1/2012. 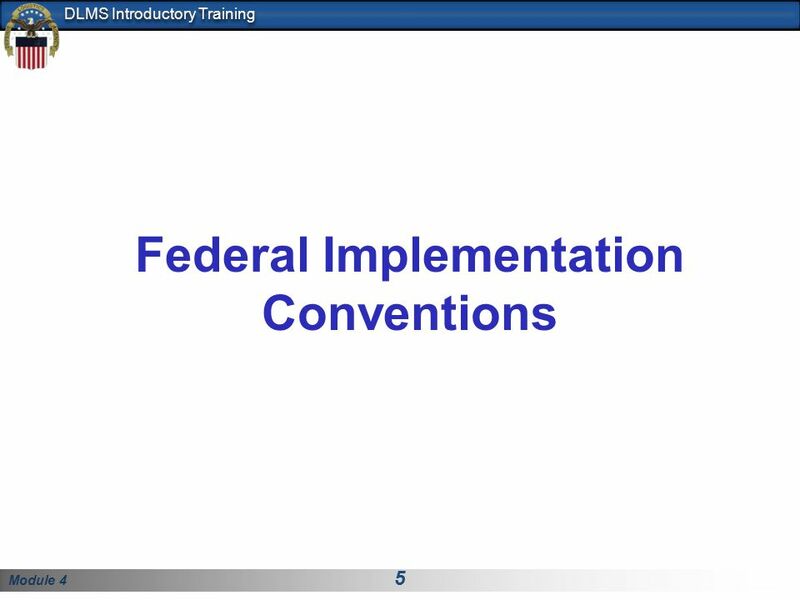 Standard Financial Information Structure (SFIS) Overview Presented by: Ray Bombac Business Transformation Agency. 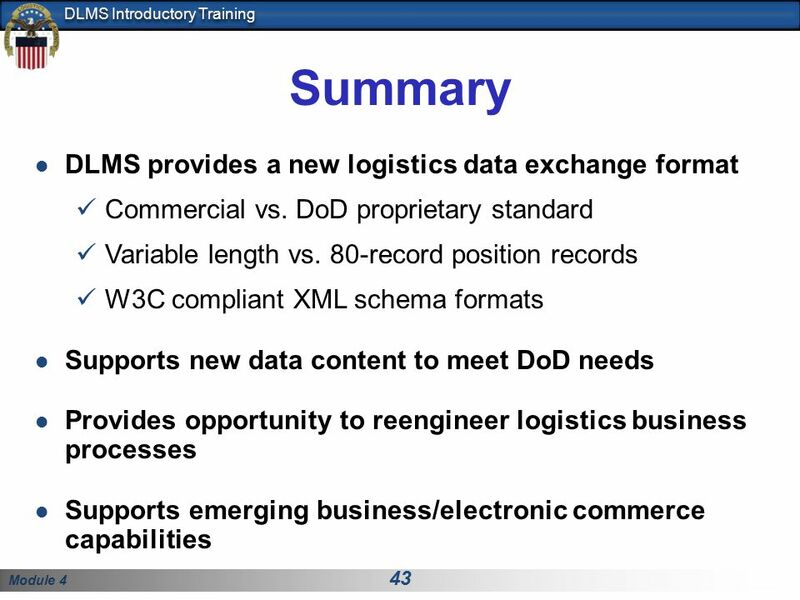 Supply Discrepancy Reporting DoD Web Submission Ellen Hilert J673 Defense Logistics Management Standards Office. Published Procedures for Wrong Item Discrepancies (2001) Incorrect Item. Report incorrect or misidentified material or unacceptable substitutes regardless. Please use the following two slides as a template for your presentation at NES. Completing the DD Form 1149: — A Basic Perspective Walt Clark, CPPM Property. 1 WARFIGHTER-FOCUSED, GLOBALLY RESPONSIVE, FISCALLY RESPONSIBLE SUPPLY CHAIN LEADERSHIP DEFENSE LOGISTICS AGENCY AMERICA’S COMBAT LOGISTICS SUPPORT AGENCY. IUID – Future Policy As agreed by the Joint Logistics Board in April 2010, IUID marking requirements (for both legacy assets and new procurements) to be.